We had an outfit that we used on set. It’s impossible when you’re talking about an otherworldly outfit like the one that the Panther wears, which has a certain luminescence to it because it’s made of a woven metal. We could never afford to construct an outfit like that that an actor or a stunt player could move around in without sweating to death or that would capture the luminescence that we need. So what we ended up doing in post is ILM came in and painted over Chadwick and the stuntman. The outfit is completely CG. To be clear, there was an actor or stuntman in a suit, performing on set. Their work created the reference points that ILM used to bring the CG Black Panther to life. That Marvel Studios would completely animate a suited hero isn’t all that surprising; characters like War Machine are heavily reliant on computer effects already, and Spider-Man was pretty clearly digital (and rubbery) for most of his scenes. 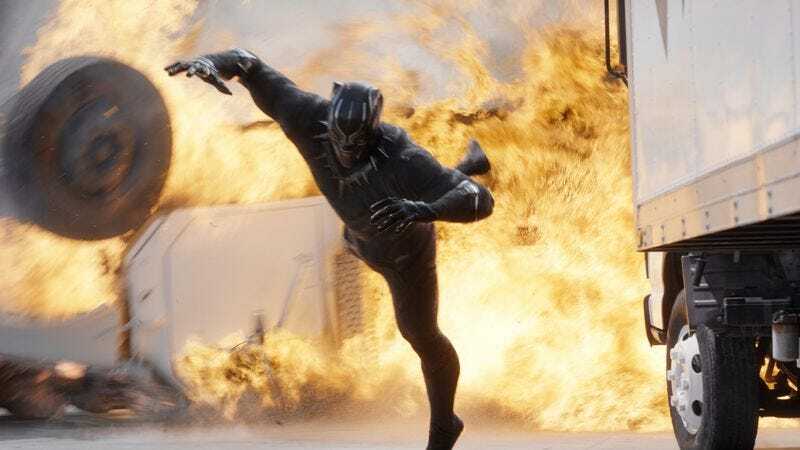 But given these more obvious animated characters, T’Challa’s digital alter-ego is noteworthy for looking real and blending in with physical sets and actors. It also means that Chadwick Boseman can probably focus more on delivering a grittier performance when production starts on the standalone Black Panther film next year.